In 1994, New Mexico State University and the Navajo Agriculture Production Industry conducted a trial using Menefee Humate™ on onions. The trial consisted of two treatments. The first treatment, Grower Standard, was the grower’s standard fertility program. The second treatment, Humate, had 100 lbs per acre of Menefee Humate™ added to the fertility program. 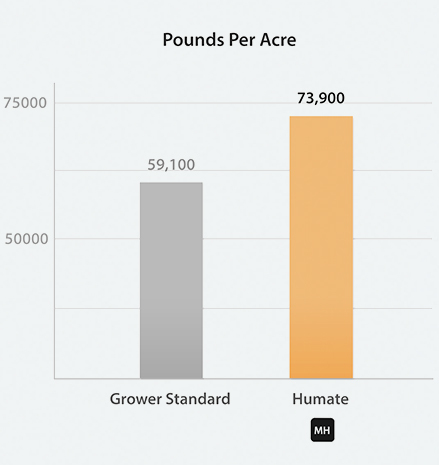 Treated rows experienced a 25% increase in yield with Menefee Humate™. Rows treated with Menefee Humate™ showed 97% fewer defects and less prepacks than the control plots. Pungency also decreased, correlated with a decrease in sulfur content of the leaves.